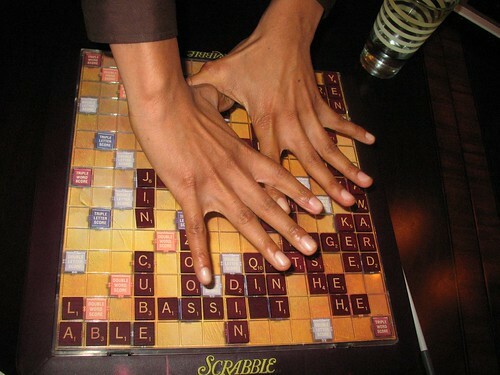 “Maybe, it’s a French word, I’m thinking of...I don’t know...I guess I’ll try it...I mean, you might challenge it, but whatever, I’ve got nothing else,” KJ said as he caressed two tiles between his fingers. He then put down an s and an h forming qats and ash on the double word square for 38 points. Not. My. First. Rodeo. Buddy. Challenging qats! He clearly has no idea who he’s dealing with. But I drew a blank and managed to bingo with “reality” to take a small lead and then he played hu and I managed to draw the second blank after challenging his play and playing off some of my crap letters, I then bingoed with bassist. As the game went on, the word knowledge gap devoured KJ. I won the game handily, but I found myself unsure of certain three letter words that at the height of my Scrabble game, I knew cold. Time to hit the books...don’t want a repeat of the Queens tournament when I go out to Reno in the Winter.